This healthy, no-mayo Mediterranean tuna salad is light and full of flavor thanks to some fresh basil and roasted red peppers. Instead of traditional mayo, it’s simply dressed in lemon juice and extra virgin olive oil. Can canned tuna be… pretty? I like to think so. I’ve long since been a lover of tuna salad. You know, the smothered in mayo variety? Yep. I kind of adore it in all of it’s creamy, artery-clogging amazingness. Oh! And tuna melts! Come on, everything I just said PLUS melted cheese?! Yes, please! Lots of folks avoid using mayo. And even though we’re allowed mayo on the 21 Day Fix, if you’re on the lowest bracket, you only get 2 teaspoons per day and that’s just not enough (at least not for me!) to make a good tuna sammie. In short: a bright and fresh lemony dressing. No wait – hear me out. So here’s the tale of my switcheroo… Several years ago, I was watching Rachael Ray and I heard her say that she doesn’t like mayo. I’m sorry, what? No comprendo, Rach. Mayo is where it’s at. Anyway, she continued on saying that since she doesn’t “groove” on mayo (she really loves that word) she dresses her tuna sandwiches in lemon juice and olive oil. That sounded interesting to me at the time, but then I quickly forgot about it (or blocked it from my memory, because remember? I <3 mayo). A while later (possibly years), I was flipping through Cooking Light Magazine when I happened upon a recipe called Tuscan Tuna Sandwiches, using the lemon and olive oil that she had mentioned. Truth be told, it was pretty difficult for me to imagine enjoying tuna in anything other than mayonnaise, but after seeing it in print, I figured why not? I was trying to eat healthier anyway, maybe it would be a decent substitute for my mayo-drenched buddy. Well, I suppose the rest of this story is pretty obvious… I tried it, my mind was freaking blown, you get the picture. I really loved how light and fresh it tasted, it was such a completely different tuna experience. Who knew tuna could even taste “light” (or fresh, for that matter, it does come out of a can after all)? Anyway, this recipe is my take on a lightened up no-mayo tuna salad and I hope you love it! How long will tuna salad keep in the fridgerator? Tuna salad with mayo AND this no-mayo Mediterranean Tuna Salad, will both keep in the fridge for 3-5 days. One of the many things that I love about this salad is that because it doesn’t include dairy, it’s perfect for a picnic! You can serve it with your carb of choice… sandwich thins, bread, pita, etc.. or on top of greens for a big ol’ salad. Not to mention that putting this tuna salad on some crackers would make an awesome snack! Yum! One quick note about tuna: you may already know this, but tuna contains mercury. The tuna used in this recipe (chunk light tuna) is a type of tuna lowest in mercury, but the U.S. Environmental Protection Agency still says that you should only eat up to 12 ounces of it per week (that’s a little over 2 cans). I felt the need to mention that because it seems like something that isn’t talked about all that much and pretty important info in my opinion! 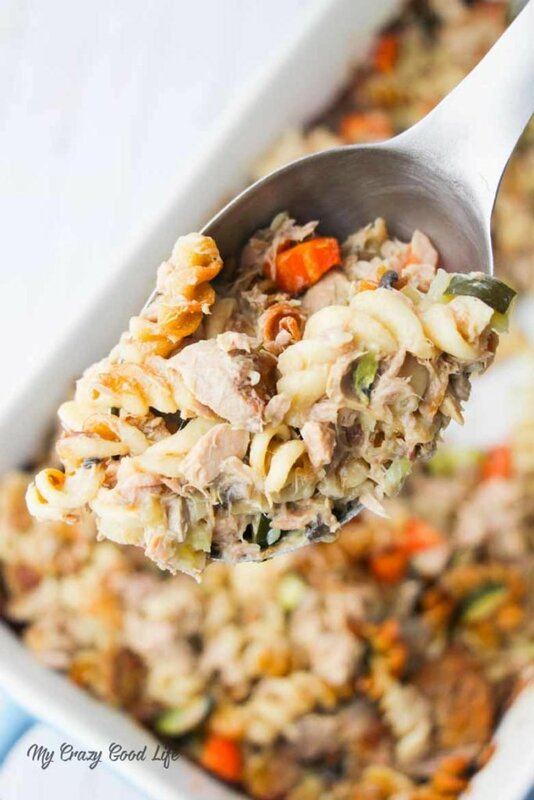 Save this 21 Day Fix No-Mayo Mediterranean Tuna Salad to Pinterest ↓! In a small bowl, whisk together the lemon juice and olive oil until emulsified. Stir in the tuna, red onions, roasted bell peppers and basil. Season to taste with black pepper. Boom. Serve as a sandwich with bread, half of a pita, or a sandwich thin. This is also AMAZING served over some greens for a yummy, filling salad. WHAT WOULD BE THE CONTAINER EQUIVALENT IF I ADD THE PITA BREAD?? Hey Kaira! Pita bread counts as a yellow, but since they come in different sizes, sometimes 1/2 of a pita = 1 yellow. Check the stats carefully (especially the serving size), about 100 calories of a whole wheat pita will be 1 yellow. Enjoy! Oh wow this is awesome! We used tomatoes instead of the peppers and added lettuce, then put it on a naan. Fantastic! Ooh, I bet it was great with the tomatoes! Glad you liked it!